Have you ever struggled with pinpointing how to improve your product? Want to tap into a gold mine of powerful and actionable feedback right in front of you? 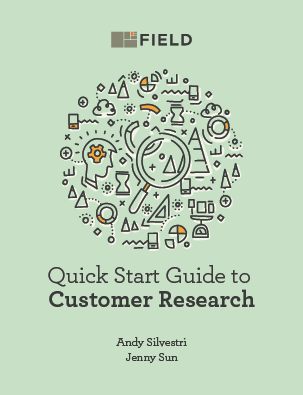 Our Quick Start Guide to Customer Research will walk you through each step of the research process and show you how to have productive conversations with your customers. The feedback you gather will help validate ideas, unearth product-changing insights, reveal inefficiencies and hang-ups in your user experience, and shed light on valuable new features that you may never have considered. Tired of Stabbing in the Dark? Plus, you'll get exclusive content in our weekly insights newsletter to help improve your product!